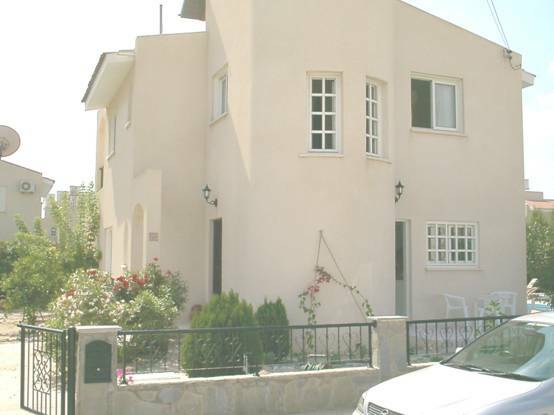 This is a lovely 3-bedroom villa with private swimming pool, located in beautiful Coral Bay. Situated on one of Cyprus' most impressive coastlines and enjoying close proximity to the beach and its facilities, this well furnished, fully airconditioned and well equipped property offers guests a chance to enjoy Cypriot living at its best.The villa is ideal for couples or families it is tastefully decorated, with bright, airyrooms, floor tiling to the ground floor, whitefabrics and calming accessories throughout. Theaccommodation is designed on two levels, with the main level housing the spacious open plan living area and dining room. This opens to a lovely terrace with outdoor dining area that overlooks the private swimming pool and pool terrace. The internal rotunda stairs lead up to the master bedroom and 2 further bedrooms on the first floor.The private garden is lush with bougainvillea, roses and fruit trees, and is a short walk from the wonderful renowned Coral Bay Beach. Sun loungers are provided on the swimming pool terrace.Ground floor Accommodation Entrance hall leads to spacious open plan living area and dining room with air conditioning; the TV, VCR and hi-fi are situated in this room. 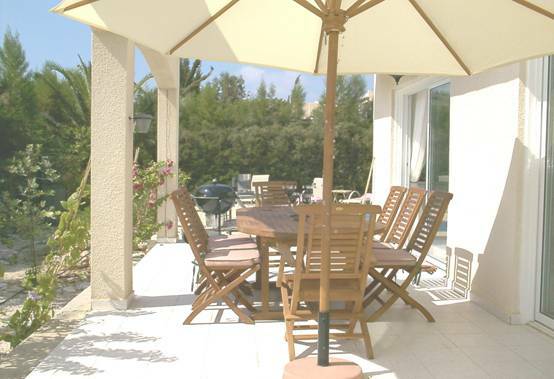 This room opens on to the terrace with outdoor dining area including a barbeque. The kitchen is well equipped with a microwave, dishwasher, washing machine, with ironing facilities and fridge / freezer. The kitchen opens on to an open terrace with small dining area. The guest WC is situated off the hallway. First floor Accommodation comprises Master bedroom (double), with television, opening onto large first floor terrace with sitting area overlooking the garden and pool area. Twin bedroom opening to first floor terrace with sitting area. 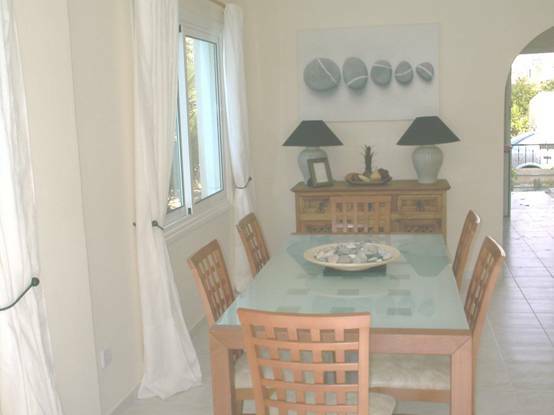 Light and airy third twin bedroom overlooking the pool area. All bedrooms are equipped with airconditioning and built in wardrobes.Bathroom with shower. The villa will be prepared for your arrival and a weekly maid service is included in the rental cost. All household linens are included in the rental, though we would advise packing beach towels as we request that the towels provided are not used forbeach trips. Board games, books and music CD's etc are left in the villa to enhance your holiday.A cot with bed linen is permanently available together with a toddler booster seat and high chair. Please confirm if required at time of booking and we will ensure that this is prepared for your arrival.We have provided crockery, cutlery and toddler cups for lighter travelling, however should you require sterilizers etc for your baby we suggest that you pack those.Toys, books, CD's and videos particularly for children are also in the villa.